Huge Savings Item! 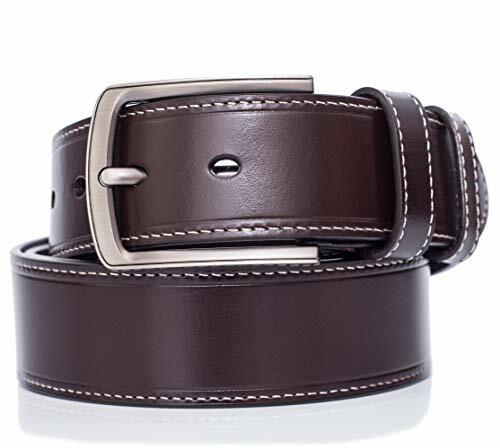 Save 17% on the Full-grain Leather Belt For Men Top Quality, pin buckle, for 34''-36''/3BROWN XS by MILEKE at SCRHI. Hurry! Limited time offer. Offer valid only while supplies last. ABOUT LEATHER: Our full-grain vegetable-tanned leather is tanned with vegetable ingredients. It's more friendly and more desirable to man. Our full-grain vegetable-tanned leather is tanned with vegetable ingredients. It's more friendly and more desirable to man. Leather belt should be kept away from sharp items, oil / chemicals, water / high humidity, and direct sunlight / heat sources. So keep it in dry and clean place. Clean it with dry & soft cloth. Leather belt also needs a rest after days of use. Avoid wearing it all the time. It will serve you for years under proper maintenance. ◆SIZE DATA◆ - strap length: 42"/105cm, fitting for waist size 34"-36". Thickness: 5/32" (3.85mm), width: 1-1/2" (3.8cm). If you are big and tall and need an XXXL belt for waist size longer than 46", just contact us for a personalized size belt. We will surely get you satisfied. If your waist size is under 30", no problem! You can buy any size and shorten it with our hole puncher packed with the belt. See size chart easy shortening method on picture 7 on the left. ◆FASHIONABLE STYLE◆ - our fashionable buckles plus classic colors black and brown will be a unique match to men's wear. It is not only suitable for daily wearing, but also designed for jeans, suit, and uniform, etc. It will makes you more fashionable and stylish in different occasions, such as labor working, business, travel, hunting, and other outdoor activities. It's an essential accessory to men's wardrobe! ◆SUITABLE GIFT◆ - want to surprise someone on special occasions such as holiday, birthday party or anniversary? Just present our high quality leather belt to him: either your classmate, superior, boyfriend or family members like son, husband, father and the elders. Our belt is packed with an attractive gift box, which will definitely makes your gift more impressive. A good belt makes his day, and above all, makes him confident! Choose this right gift for him! ◆GOOD QUALITY◆ - the belt is made under strict criteria in material sourcing and product manufacturing. Our alloy metal belt buckle is solid and well-plating. We carefully choose qualified leather of fine and smooth grain that you can hardly find any scar or vein mark. Our professional craftsmen proceed with full responsibility. They repeat coating and polishing the strap again and again until the edge and the inner side are smooth enough. Every belt will be checked carefully before packing. ◆CARE-FREE WARRANTY◆ - we are confident of our products. Every item is checked carefully before packing. Even there is only one left in stock, it would be in good condition. We try our best to provide you a great shopping experience. Therefore, we guarantee you 30 days of free exchange and returns plus 180 days warranty. However, it doesn't means we will not take care of your problems afterwards. You can just feel free to contact us with any issue. See product description for belt maintenance. If you have any questions about this product by MILEKE, contact us by completing and submitting the form below. If you are looking for a specif part number, please include it with your message.